A test gone wrong leaves Jack and Teal'c marooned in space aboard a damaged prototype attack ship. The United States has finally put to good use those two Goa’uld death gliders taken from Apophis’ mothership (“The Serpent’s Lair”) after thwarting his attack on Earth two years ago. After studying the ships for that time, Area 51 personnel have created a hybrid vessel that looks like a death glider on the outside, and a jet plane on the inside. Teal’c flies a demonstration of the new X-301 interceptor at a military airfield, impressing Pentagon representative Lt. General Vidrine. The test continues as Colonel Jack O’Neill boards the plane. He and Teal’c will demonstrate the ship’s weapons capabilities, firing on target drones. General Hammond, Vidrine, Major Davis and the rest of SG-1 monitor the test from Stargate Command. But all does not go as planned. Teal’c loses control of the ship, and the vessel climbs out of the atmosphere and races into space. The voice of Apophis himself booms out at them, telling them that he had installed a recall device in the gliders in case Teal’c ever found himself in one again. The vessel is apparently programmed to return to Apophis’ home planet; it is Teal’c’s punishment, doomed to die in the coldness of space. He believes that the former System Lord installed the devices in his gliders because of Teal’c’s betrayal. Their ship rushes away from Earth at a million miles per hour. Communication with the S.G.C. begins to lags for several seconds, and then for minutes as the ship gets farther away from Earth. Samantha Carter and Daniel Jackson work frantically to try and find a way to save their teammates. Carter does not want them to try and deactivate Apophis’ device, believing it probably has a built-in safeguard. Remembering that the ship is equipped with two rockets, Colonel O’Neill suggests using them to turn the ship around. Carter quickly calculates the exact timing and burn duration, in the hopes of sling-shotting the ship around Jupiter and return them home. They’ll also have to override the computer’s protocols to prevent the rockets from detaching. The plan is executed as the ship nears Jupiter, but a systems fault causes one of the rockets to detach and spiral out of control, coming back and striking the glider. Teal’c and Jack survive, but the ship is damaged — and the course correction insufficient to prevent them from heading out of our solar system. What is worse, the two men now have but a day’s worth of air. They shut down all nonessential systems to conserve power, as Cheyenne struggles to come up with a new plan. Daniel contacts both the Tok’ra and the Tollan. Neither have ships available that are close enough; but there is a Tok’ra operative undercover on a nearby Goa’uld world. The Tok’ra refuse to disclose who the operative is or where he is — but Sam deduces the location, as it is the only Goa’uld-controlled world within a day’s travel of Earth. She and Daniel go through the Stargate to P2C-527, and find Jacob Carter. They convince him to abandon his mission and race to the glider’s location. Meanwhile, Jack and Teal’c have come to the unsettling conclusion that they will likely not survive the wait. They are asked to hold out for another 24 hours, but have less than 12 hours of oxygen remaining. Teal’c expresses his thanks for O’Neill’s friendship, and enters a deep state of kelnorim — Jaffa meditation — to conserve oxygen. He is successful, and the three of them escape seconds before death gliders sent out from the motherships attack. 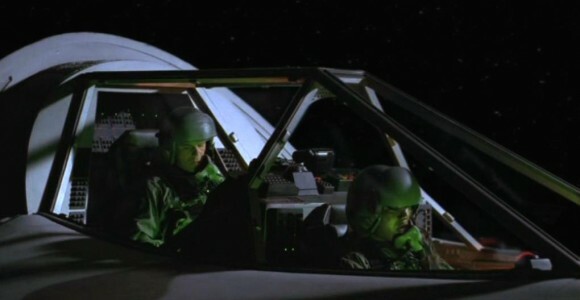 All is quiet in the cockpit of the X-301, as Teal’c meditates and Jack tries to sleep. The ship continues on its course away from Earth’s solar system and into deep space. On Earth, General Hammond and Major Davis can do nothing for them — only wait for Sam and Daniel to come to the rescue. Through his fatigue and oxygen deprivation, O’Neill makes occasional reports back to Earth. Hammond radios to tell them not to give up hope, but with no new information to pass on he orders Major Davis to let the men sleep. Finally, the rescue team arrives in the scout ship. They find both Teal’c and O’Neill unconscious, and pray that they are still alive. Radio communications cannot wake either of them, so Jacob uses the ship to nudge the glider. The jolt wakes up Jack, who is delirious due to oxygen deprivation. Carter convinces the two men to trust her, and take a very literal leap of faith. They breathe the last of their oxygen and blow the hatch, pushing off toward the Tok’ra ship above them. The ship does not have the technology to simply transport them aboard, nor is the cargo hold large enough to accommodate the X-301. But if Jack and Teal’c can get within five meters of the ship, the on-board transport rings can grab them. The plan works, and the two are saved. They give their thanks to Jacob for his help, and radio their success back to Earth. The X-301 interceptor is Earth’s first success in acquiring and developing new technologies with which to fight the Goa’uld — although it failed in its trial run. (Though the prototype has been lost, it may still be possible for the folks at Area 51 to create another.) Acquiring advanced alien technology is one of the S.G.C.’s primary missions, one at which it has failed miserably over the past three and a half years (“The Other Side”). The ship was designed as a platform from which to launch an attack on invading Goa’uld vessels. It was equipped with stealth capability, and armed with two AIM-120A air-to-air missiles, each loaded with a naquadah-enhanced warhead and a shield modulator. This would, in theory, allow the missiles to break through a Goa’uld shield. The detonation would be enormous, due to the powerful nature of naquadah (the same mineral out of which the Stargate is made). Following testing, the ship was to be assigned to orbital defense under the command of the S.G.C. It stands to reason, based on the missile armament and the increasingly common use of naquadah reactors (“New Ground,” “Scorched Earth”) that the S.G.C. has secured a more reliable source of naquadah. Earth may have reached a trade agreement with Edora, a world rich in naquadah (“A Hundred Days”). How does the X-301 fly? To be honest, even the people who developed it don’t fully understand the physics. But according to Carter, it “takes inertia out of the equation.” One result is that the pilot is almost entirely immune to ordinary G-forces. It seems odd that Apophis’ recall device would activate when it did. Teal’c has flown the ship at least two other times: in the demonstration for Lt. General Vidrine, and when he originally stole the death glider from Apophis’ ship (“The Serpent’s Lair”). Yet the device did not activate until his third time in the pilot’s seat. After Teal’c’s betrayal (“Children of the Gods”), Apophis apparently placed a homing device within all of his death gliders. This was not necessarily to target Teal’c specifically, but to punish any Jaffa who would betray him in the future. The Tollan did not have a ship close enough to Earth to reach Teal’c and O’Neill even within a year. This does reveal that the Tollan do explore the galaxy in ships to some degree, though we knew already that they were capable of space travel (“A Hundred Days”). It seems odd, though, since the Tollan are much more technologically advanced than the Goa’uld in other areas, such as weapons technology (“Pretense”). A Goa’uld ship could reach the Earth system in a matter of hours (“Within the Serpent’s Grasp”) — though Apophis’s staging area for that attack might have been relatively close to Earth. The Tok’ra High Council refused to contact Jacob and blow his cover on the Goa’uld mining world. Quite frankly, the Tok’ra have informed the S.G.C. in no uncertain terms that the crippling of one Goa’uld naquadah mine is more important to them than the lives of Colonel O’Neill and Teal’c. It is fortunate that the S.G.C. has explored as many planets as they have. Carter managed to find Jacob by locating the only Goa’uld-controlled world within a day’s travel from Earth (by Tok’ra scout ship). It stands to reason that an S.G. team has been to the world before (and just about every other planet near Earth with a Stargate), or at least received intelligence about it. O’Neill stated that he’s already nearly frozen to death once. He no doubt refers to his time stranded with Carter in Antarctica (“Solitudes”). Tok’ra and Earth relations continue to be strained, due primarily to petty politics between the two allies. The death glider recall devices were known to the Tok’ra, who neglected to inform Earth about them. Likewise, Earth neglected to inform the Tok’ra that they were experimenting with adapting Goa’uld technology to their own. It sounds as if the voice coming from the Goa’uld mothership said “Heru’ur,” apparently indicating that Sam, Daniel, and Jacob encountered part of the Goa’uld System Lord Heru’ur’s forces. It should also be noted that Jacob was well aware that they would encounter Goa’uld in this region of space. The Goa’uld control at least one world within only a day’s travel of Earth. This should be considered a great strategic disadvantage by the S.G.C. In the case of escalating conflict between Earth and the Goa’uld (especially should the Protected Planets Treaty negotiated by the Asgard fail), it would be in Earth’s best interest to secure this world immediately. Goa’uld death gliders appear to be equipped with artificial gravity generators: O’Neill successfully tosses a pen at Teal’c to wake him up. Transport rings do not need a specific receiving end to work. A ship equipped with rings can transport aboard something below the ship, but it must be within about five meters — i.e. the space that is physically occupied by the rings themselves. This may be the only episode of Stargate SG-1 to date where the Stargate itself — though it is used by Sam and Daniel to gate to the mining planet — never appears. Teal’c – Teal’c was most certainly enjoying himself as he piloted the highly advanced, highly maneuverable aircraft. But when a recording of Apophis declared the reason for the ship’s malfunction, Teal’c realized that he was responsible for their predicament. Yet again, his betrayal of Apophis has come back to haunt him, to hurt those he cares about. In the face of death, Teal’c also expressed the depth of his friendship with O’Neill. “We are brothers,” he told the Colonel, citing the many battles they have fought together. Though he faced death, Teal’c was prepared to face it honorably. Jacob Carter – Jacob has gained a new perspective on the human race during his two years with the Tok’ra, and it is colored by the Tok’ra’s arrogant view of humankind as “infantile.” He chastised them for trying to adapt advanced Goa’uld technology for their own purposes. But, in many ways, he is right: as a former Air Force General and now Tok’ra liaison, he is uniquely qualified to make such a judgment. Nevertheless, even Jacob seems to have been caught up in the recent political maneuvering between Earth and the Tok’ra. Why didn’t the homing device activate until now? Will Jacob return to the Goa’uld naquadah mine to complete his mission? Whose Goa’uld motherships did Jacob, Sam and Daniel encounter? Can the X-301 be recovered (with help from the Tok’ra), or another prototype constructed? VOTE! How would you rate SG-1's "Tangent?"